When I started making the previous Burlap Pillow I got the idea for this pillow (I didn't set out to make two pillows, I only needed one, but I just had to make it). I had purchased a bunch of buttons this past summer for a $3.00 a bag and they had some really neat buttons in them (it also made for a fun 30 minutes or so with Em sorting them into jars of small, medium and large). This is definitely a decorative pillow - all those buttons wouldn't feel very good to sit up against. 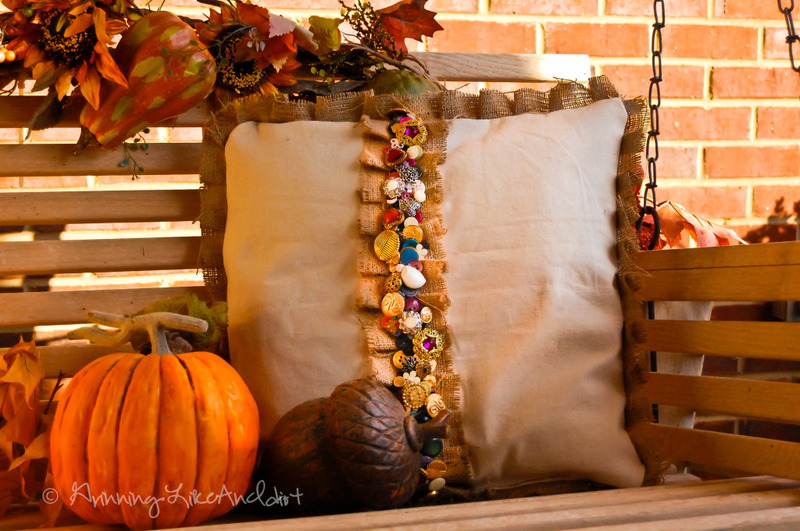 If you make this pillow, all you need is burlap material, canvas material, buttons, and patience. This pillow was another pillow in which I spent some quality time with Em: I sewed on the buttons while watching a Barbie movie with Em. Em would hand me the buttons to sew (and sometimes she would even thread them on the needle) and once I had sewn on about 10 buttons, I then tied it off, that way if it breaks at some point, I only have to mend a small section of the pillow.